How to defend a dog attack? 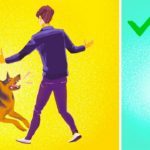 What should you do if you’re attacked by a dog? Should you run or fight? There is the only one way to survive. You are enjoying your morning run in the park before work, and then suddenly a stray dog runs up to you, looking like it’s ready to attack you. Here are the most helpful recommendations of experts on how to keep yourself safe from dogs or what to do if you get attacked. TIMESTAMPS Who is at risk? 0:35 Avoiding the attack 0:58 Defending yourself 4:04 After the attack 5:19 SUMMARY – Most of the time joggers, cycles, and other fast-moving people get attacked. – Don’t panic. Don’t try to run. Stand still. Don’t make eye contact. Make fists. Distract the dog with another object. Command the dog to «Back away!». – Fight back. Yell for help. Protect your face and neck. – See a doctor. Report the dog. Tell us about your experience with dog attacks in the comment section below and share this video with your friends to keep them safe.